Essentially, he is a real-life version of Disney-Pixar's WALL-E robot. As mentioned, Cozmo comes to us from Anki, the company who brought us Overdrive and the upcoming Fast and Furious Edition of Overdrive later this year. He is an AI-powered, palm-sized robot that will interact with you throughout your day. Controlled via your Android or iOS device and a Bluetooth 4.0 connection Cozmo will learn about you, your family, pets and his surroundings by exploring and playing games. In the box with Cozmo, you will also receive a charging cradle and 3 Interactive Power Cubes to play games and complete tasks with. If you pre-order Cozmo before June 26, 2017, you will also receive a free Cozmo carrying case. For example, if you beat him at one of his favorite games which pits you and Cozmo against each other in a contest to see who can tap one his bricks first when it changes color, Cozmo is likely to morph into the robot equivalent of a toddler who is having a small fit. Cozmo can navigate thanks to a small VGA camera and very sophisticated facial recognition software developed by Anki. This software allows Cozmo to remember every interaction he has. Say he meets someone new. Initially, Cozmo may turn and drive away or show caution when approaching a new face. However, because he can remember each interaction, he will warm up to you over time and be less likely to run away. When Cozmo is angry, like in the gameplay example, or shy, like in the new face example, Cozmo will show his emotions and reactions on his facial display, much more akin to WALL-E's friend EVE. 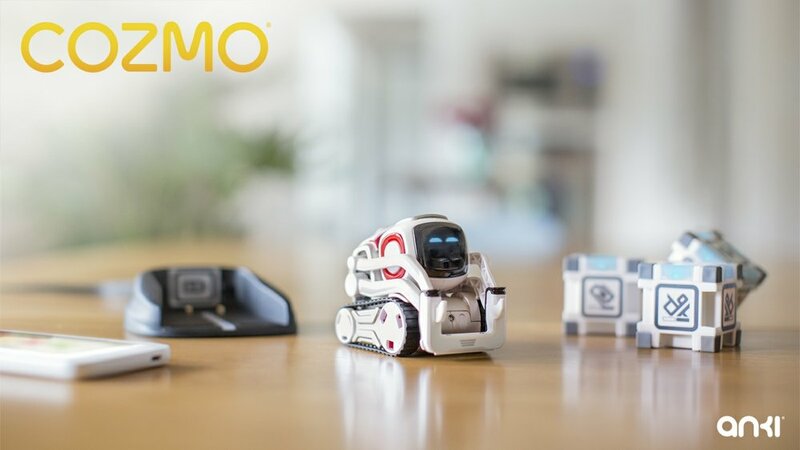 Anki also has released a Cozmo SDK which enables developers and enthusiasts alike to create more advanced Cozmo experiences. Click here for more SDK info (https://anki.com/en-ca/cozmo/sdk). I am very excited for Cozmo to make the trek north of the border into Canada, but Anki isn't stopping there! Cozmo will soon be available in the UK, Germany, France, Norway, Denmark, Sweden, and Finland. Over on Anki's YouTube channel, they have assembled a series of fun #cozmomoments videos. Be sure to check them out if you would like to see Cozmo in action, but here is one of my favorites. Cozmo will be available sometime in July, the exact date however, has not been confirmed as of yet. According to Anki.com, Cozmo will be selling for $250 CAD. Other Anki products are up for purchase at a variety of retailers, but in Canada Best Buy will be the exclusive home for Cozmo. Also worth noting, is the Collector's Edition of Cozmo coming in September 2017. He appears to be USA only for now though. Have a look at Cozmo's new liquid metal look below! Are you excited to get your hands on Cozmo? I certainly am!